Freedom Partners, formally known as the Freedom Partners Chamber of Commerce (and previously the Association for American Innovation), describes itself as a "nonprofit, nonpartisan, 501(c)(6) chamber of commerce that promotes the benefits of free markets and a free society." Koch Industries issued a press release stating that Freedom Partners is legally separate from the corporation, but Freedom Partners is controlled by Koch loyalists. Politico describes the group as "the Koch brothers' secret bank." Additionally, a document discovered after the winter 2014 donor meeting revealed extensive one-on-one meetings between donors and "representatives of the political, corporate, and philanthropic wings of Kochworld." Raising $256 million during the 2012 election cycle, it served as a "de facto bank" in the Koch network by "feeding money to groups downstream." It is run by former top AFP strategist Alan Cobb and wages "a behind-the-scenes push in state capitols for reforms consistent with the brothers’ small-government, free-enterprise philosophy, including possibly curbing union power and abolishing income taxes." Freedom Partners was previously chartered as a Delaware corporation, but as of 2017, it lists Arlington Virginia as its address. Adam Laxalt (R): $2.5 million in ads placed by the Koch network's Freedom Partners Action Fund in support of his run for governor of Nevada. Reviews of the Freedom Partners 2017 990 disclosure forms gathered by the Center for Media and Democracy found that the group raised $127.3 million and spent over $115 million in 2017. The latter number included $18.7 million in compensation, salaries, and wages presumably for the groups in the network, equating to 15 percent of the total raised. A large portion, $47.5 million, of the Freedom Partner spending went to Americans for Prosperity. $15.6 million went directly to i360 while that group's public relations firm "In Pursuit Of" received close to $8 million in 2017. In addition to those grants, Freedom Partners doled out millions to disregarded entities and c-corporations, "a practice the Kochs use to further muddy the money trail." Rep. Todd Young (R-IN) received $1 million in support of his race for U.S. Senate from the Freedom Partners Action Fund in the form of TV and digital attack ads on former Sen. Evan Bayh (D). Freedom Partners Action Fund spent $7.6 million on ads opposing Joe Heck’s opponent, Catherine Masto, in his race for the Nevada U.S. Senate seat. Freedom Partners Action Fund placed over $6.74 million in ads opposing Gov. Strickland, that assisted Sen. Rob Portman in his reelection bid. Sen. Pat Toomey (R-PA) received $7.08 million in support in the form of digital and tv ads opposing his opponent Kathleen McGinty. Sen. Ron Johnson (R-WI) received FPAF support of $2.69 million in ads attacking Russ Feingold, his opponent, and in supporting his record. Bill Cole received $100,000 from FPAF to his PAC Accelerate West Virginia for his run for Governor of West Virginia. View the 2016 election cycle Freedom Partners Ads here. Freedom Partners again hosted the Koch network's winter donor meeting January 30-February 2, 2016 at the Renaissance Indian Wells Resort & Spa in California. Membership to this gathering reportedly costs $100,000. According to reports, Freedom Partners did not commit to endorsing a Presidential candidate at the meeting. However, they came up with five preferences for the GOP candidacy: Marco Rubio, Ted Cruz, Jeb Bush, Rand Paul and Carly Fiorina. The following public officials attended the meeting: Sen. Ben Sasse (R-NE), Rep. Jeb Hensarling (R-TX 5th), Arizona Gov. Doug Ducey (R), West Virginia Lt. Gov. Bill Cole, Rep. Ron DeSantis (R-FL 6th), Rep. Tom McClintock (R-CA 4th), and Nevada Attorney General Adam Laxalt. Freedom Partners sponsored the Koch network's winter donor meeting the weekend of January 23, 2015 at a hotel in Palm Springs, California. Sources told Politico that Republican politicians including "Sens. Ted Cruz of Texas, Rand Paul of Kentucky and Marco Rubio of Florida, and Gov. Scott Walker of Wisconsin received coveted invitations to speak to the vaunted network assembled by the billionaire industrialist megadonors Charles and David Koch." Walker's plans to attend were confirmed by a campaign spokesperson. The 2014 midterm elections were remarkable for the increasingly important role of campaign spending by outside groups. Freedom Partners worked "in tandem" with Americans for Prosperity (AFP), together spending around $100 million on midterm races, according to the National Journal. While AFP spent significant amounts early on in 2013, Freedom Partners ramped up its spending on ads later in the race. "Freedom Partners Action Fund, a super PAC, is slated to spend $25 million by the time the cycle finishes, said spokesman Bill Riggs, including the $2.1 million it has reserved for the runoff Senate race in Louisiana," the National Journal reported. By the end of the election cycle, Freedom Partners had spent more than American Crossroads, the New York Times reported.. According to the Washington Post, unlike the 2012 election, when Freedom Partners raised $256 million from unknown donors and then funneled that money through a complex maze of LLCs and nonprofits, this election cycle Freedom Partners "is bringing in-house many of the functions it financed through other groups in the last campaign." The Post reports that, "The organization’s elevated role speaks to how the Kochs are exerting more control over the political activity they fund, a strategy that provides more accountability to fellow conservative donors who want to know how their money is being spent." In an interview with Yahoo News, Freedom Partners spokesman James Davis said, “We’ve expanded quite a bit. I think it’s just an evolution and growth of Freedom Partners, and we’ll continue to grow.” He added that Freedom Partners was planning to play more of a role in the 2014 elections after the April advertising campaign against Democratic Senate candidates. Freedom Partners spent $2 million on ads against Democratic Senate candidates in April 2014 and has doubled its staff to over 100 employees since late 2013. Spokesman James Davis explained that "We’re really looking long term — beyond any given election cycle." As of October 2014, the Freedom Partners Action Fund PAC had "raised nearly $21 million to help Republicans in midterm races," USA Today reported, the sum of just 39 contributions. That included contributions of $4 million from the Kochs, made through two trusts, and $1 million each from "Paul Foster, the billionaire executive chairman of Texas-based Western Refining; Arkansas-based poultry producer Mountaire; and a trust controlled by Roger Stone, the CEO of an Illinois packaging company." By October the PAC had already spent around $15 million, and announced plans to spend an additional $6.5 million on TV ads in battleground states with key Senate races, including Colorado, Iowa, New Hampshire, Alaska, North Carolina, and Arkansas. In 2014, Freedom Partners contributed $693,289 to the Freedom Partners Action Fund. In June 2014, the Koch brothers' annual summer summit was held behind closed doors at the St. Regis Monarch Beach Resort in Dana Point, near San Diego, California. The event was coordinated by Freedom Partners and, according to one source, was attended by "300 individuals - worth at least a billion each." During the summit, the creation of a super PAC called Freedom Partners Action Fund was announced. Politico reported that "The new group aims to spend more than $15 million in the 2014 midterm campaigns — part of a much larger spending effort expected to total $290 million." According to Koch operative Marc Short, "The Freedom Partners Action Fund will support candidates who share our vision of free markets and a free society and oppose candidates who support intrusive government policies that push the American Dream out of reach for the American people." Politico described the creation of the super PAC as "an evolution" for the Koch brothers, whose network of organizations has previously focused mainly on attacking politicians and policies they opposed, rather than supporting candidates. In previous election cycles, the network has relied on 501(c)(3) and 501(c)(4) non-profits, as well as trade associations, organized under 501(c)(6) of the IRS code, none of which is required to disclose the names of their donors. According to The New York Times, :"Strategists working with the Kochs concluded that the approach, while preserving the secrecy of donors, limited the political impact of the groups’ efforts. With the Kochs already the subject of aggressive and personal attacks by Democrats, and after reports that revealed the names of many of the wealthy donors working with them, Freedom Partners concluded that the flexibility afford [sic] by the super PAC was worth the headaches that increased disclosure may bring, according to a person who attended the group’s most recent conference, held earlier this week." America’s abundant and affordable supply of energy – and the economic impact it brings – faces many threats. Environmental regulations, an unaccountable federal bureaucracy, activist judges, and the fringe environmental groups are working together to stall the production and use of these vital resources. Kevin Gentry's email discussed how the energy initiative was launched in response to a plan by liberal donors to spend as much as $100 million to make climate change a top-tier issue in the 2014 election cycle. Freedom Partners aired this untruthul attack ad against Rep. Bruce Braley that was rated by fact-checkers as "pants on fire"
On April 8, 2014, Freedom Partners began a $1.1 million advertising campaign against Representative Bruce Braley (D-IA) and Senator Mark Udall (D-CO) that ran for three weeks. The ad claims that Braley took "tens of thousands from his friends in the health insurance industry" and gave them "special favors" by voting for the Affordable Care Act. Fact checkers determined that Braley has received "$20,500 from health insurance sources...about $2,000 for every year he’s served in Congress" and total "insurance donations account for less than 1 percent of all the cash Braley has raised during his political career." Norman Ornstein, a congressional scholar at the conservative American Enterprise Institute, explained that Braley’s past promises and pressure from his party are likely to have outweighed any campaign donations from the industry. In rating this advertisement's claims as "pants on fire" (the most untruthful rating possible), the fact checkers stated that "It’s ridiculous to suggest that donors who contributed less than 1 percent of his warchest weighed more heavily on his vote than his ideology, his past campaign promises and his partisan affiliation." Forming the organization as a 501(c)(6) group for purposes of the tax code sets it apart from many of the other notorious and controversial "dark money" groups that were active in the 2010 and 2012 elections. These groups, such as Karl Rove's Crossroads GPS or Americans for Prosperity, are organized as 501(c)(4) "social welfare" nonprofits. IRS Section 501(c)(6) is reserved for business leagues, chambers of commerce, such as the U.S. Chamber of Commerce, or trade associations like the pharmaceutical lobby PhRMA or the American Bar Association. But, unlike those groups, there is little evidence the Association exists to advance the interests of any particular trade or industry. Marc Owens, former director of the IRS tax exempt division, told The Huffington Post, "It's possible that the Kochs think there's less audit exposure with a (c)(6)." But he added, "It's not clear to me what line of business is furthered by an innovation group. That could make it difficult to establish entitlement to (c)(6) status with the IRS." Much of the law governing both 501(c)(6) and 501(c)(4) groups is the same: political intervention cannot be their primary purpose. But the IRS rules for what constitutes political intervention are rarely enforced. This provides an opening for the Kochs and their allies to continue influencing elections from the shadows. States like California, Montana, and New York have attempted to enforce various state laws. However, another advantage to organizing the Association for American Innovation as a (c)(6), unlike (c)(4)s, is that they will not fall under the charitable trust jurisdiction of state attorneys general. Scrutiny of (c)(4) groups is likely to heat up from several angles, making a (c)(6) group more attractive. Attorney Greg Colvin, an expert in nonprofit law, told the Center for Media and Democracy, "A (c)(6) is exactly where you'd expect captains of industry to go for political leverage out of the public view, especially if the notorious 501(c)(4) organizations are about to be more heavily scrutinized and regulated by the IRS." This is especially true after the controversy surrounding the IRS targeting of tea party groups caused Senate Democrats to focus on the vague 501(c)(4) tax laws, which are seen to have contributed to this scandal. As The Huffington Post reported, Senator Max Baucus (D-Mont.) stated in his opening statement to a Senate Finance Committee hearing that, "Once the smoke of the current controversy clears, we need to examine the root of this issue and reform the nation’s vague 501(c)(4) tax laws." He elaborated, "[n]either the tax code nor the complex regulations that govern nonprofits provide clear standards for how much political activity a 501(c)(4) group can undertake. The code does not even provide a clear definition of what qualifies as political activity." Additionally, the government watchdog group Citizens for Responsibility and Ethics in Washington (CREW) filed a federal lawsuit in May 2013 asking for a judicial order that the IRS initiate a process to bring its rules on 501(c)(4) nonprofits in line with federal law, and this adds to the potential for even more scrutiny of (c)(4) groups. Freedom Partners boasts that is has over 200 donors, with each one paying at least $100,000 in annual dues, according to POLITICO. Members are drawn from semi-annual conferences hosted by the Koch brothers. Despite Freedom Partners' connection to other Koch family entities, Freedom Partners' President Marc Short claims, "Koch-linked entities provided a 'minority' of the funds" for Freedom Partners in the 2012 fiscal year. Short also noted that "the largest single donor gave about $25 million." KNSLT, Inc., whose primary activity is listed as “consulting” and who is directly controlled by Cavhoco Inc. In November 2014, Freedom Partners made an additional filing for the final two months of 2013. Freedom Partners' tax returns from the 2011 fiscal year reveal that the organization gave money to 30 groups (both private and government affiliated) between November 2011 and November 2012. (Freedom Partners 990 Tax Form, 2011) Freedom Partners, unknown to the public at the time, raised and spent $250 million during the 2012 election cycle, making it the largest financial contributor to right-wing groups in the 2012 election. Tea Party Patriots, an organization advocating "fiscal responsibility, constitutionally limited government, and free market economic policies": $200,000. National Right to Work Committee, an organization which advocates that no employee "should ever be forced to affiliate with a union in order to get or keep a job. ": $1 millio. The "American Entrepreneur Fund LLC," which had assets of $885,316 and whose activities are listed as simply as "projects,"
The "American Enterprise Group LLC," which had assets of $424,975 and whose activities are listed as "management,"
The "American Strategies Group LLC," which had assets of $97,714 and whose activities are listed as "public outreach,"
"American Strategic Innovations LLC," with assets of $4,976, the purpose of which was also listed as "research"
Of the groups that received funding, several are, "limited liability corporations that are wholly owned by better-known nonprofits -- what the IRS refers to as "disregarded entities." For example, according to OpenSecretsBlog, Corner Table LLC, Eleventh Edition LLC, and American Commitment LLC -- are all "disregarded entities" wholly owned by the Center to Protect Patient Rights. Between November 2011 (its creation) and November 2012, Freedom Partners raised $256 million and made grants totaling $236 million. Opensecrets.org documented that although Freedom Partners reported $0 in political spending in 2012, it gave nearly $60 million to groups that spent almost $180 million on political activity during the 2012 elections. David Armiak, The Koch Brothers’ Freedom Partners Group Spends $115.2 Million in 2017 ExposedbyCMD, November 26, 2018. Brendan Fischer, Kochs' Freedom Partners Spent $129M in 2014, Invested Massively in Voter Data Lists, PRWatch, November 18, 2015. Lisa Graves, Josh Duggar-led Group Funded via Koch Brothers Freedom Partners Operation, PRWatch, August 22, 2015. Lisa Graves, New List of the Dark Money Shell Game Groups Connected to the Kochs, "PRWatch", September 18, 2013. Nick Surgey, Revealed: Extensive Koch Links to New Right-Wing $250 Million Mega Fund, "PRWatch", September 16, 2013. Brendan Fischer, Ambiguity in Tax Rules and Disintegration of Election Law May Have Led to IRS Tea Party Mess, PRWatch.org, May 15, 2013. Brendan Fischer, California Elections Board Peels Back Layer of Dark Money Onion, Finds More Onion, PRWatch.org, November 6, 2012. Brendan Fischer, Kochs Form "Business League," Will Keep Political Spending In the Shadows, PRWatch.org, May 2, 2013. Lauren Windsor, Exclusive: Inside the Koch Brothers’ Secret Billionaire Summit, The Nation, June 17, 2014. Kenneth P. Vogel and Darren Goode, Kochs launch new super PAC for midterm fight, Politico, June 17, 2014. Koch Bros Start New Dark Money Group, SustainableBusiness.com, May 7, 2013. 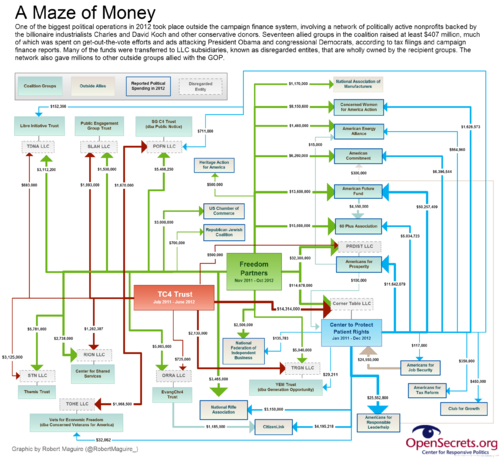 Peter H. Stone, New Koch Brothers Group Revamps Billionaires' Dark Money Operation, The Huffington Post, April 26, 2013. Peter Overby, After Tough 2012, Conservative Koch Brothers Regroup, NPR, February 28, 2013. 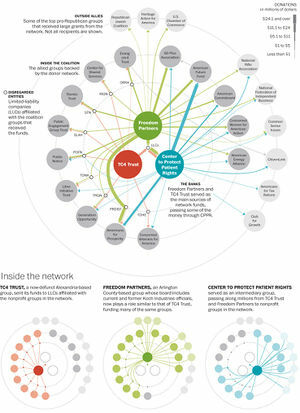 Koch Ca$h, The Kochtopus, an interactive map of the Kochs' network. ↑ Freedom Partners, "About Us," Freedom Partners website, accessed April 4, 2014. ↑ "Koch and Freedom Partners" Koch Industries Press Release. September 12, 2013. Retrieved June 24, 2014. ↑ 3.0 3.1 3.2 3.3 3.4 3.5 Mike Allen and Jim Vandehei, The Koch Brothers' Secret Bank, Politico, September 11, 2013. ↑ 4.0 4.1 4.2 4.3 4.4 4.5 Brendan Fischer, Kochs Form "Business League," Will Keep Political Spending In the Shadows, PRWatch.org, May 2, 2013. ↑ Andy Kroll and Daniel Schulman, "The Koch Brothers Left a Confidential Document at Their Donor Conference," Mother Jones, February 15, 2014. ↑ Kenneth P. Vogel, Koch World reboots, Politico, February 20, 2013. ↑ Association for American Innovation, Bizpedia.com, accessed February 2013. ↑ Propublica, Freedom Partners, Trump Town, April 2018. ↑ Freedom Partners Action Fund, Homepage, Freedom Partners Action Fund, 2018. ↑ Colton Lockheed, Koch brothers group launching $1.5M ad buy to boost Laxalt, Las Vegas Review Journal, June 27, 2018. ↑ Freedom Partners Action Fund, About, Freedom Partners Action Fund, 2016. ↑ Lisa Hagen, Koch network super-PAC launches first ad buy in Indiana, The Hill, July 26, 2016. ↑ Freedom Partners Action Fund, 24 Hour Notice FEC Filing, Freedom Partners Action Fund, May 3, 2016. ↑ Freedom Partners Action Fund, 24 Hour Notice FEC Filing, Freedom Partners Action Fund, June 25, 2016. ↑ Freedom Partners Action Fund, 24 Hour Notice FEC Filing, Freedom Partners Action Fund, July 5, 2016. ↑ Freedom Partners Action Fund, 24 Hour Notice FEC Filing, Freedom Partners Action Fund, August 1, 2016. ↑ Freedom Partners Action Fund, 24 Hour Notice FEC Filing, Freedom Partners Action Fund, August 10, 2016. ↑ Freedom Partners Action Fund, 24 Hour Notice FEC Filing, Freedom Partners Action Fund, August 16, 2016. ↑ Freedom Partners Action Fund, 24 Hour Notice FEC Filing, Freedom Partners Action Fund, August 17, 2016. ↑ Freedom Partners Action Fund, 24 Hour Notice FEC Filing, Freedom Partners Action Fund, August 22, 2016. ↑ 24.0 24.1 24.2 Federal Election Commission, Monthly Filing., Freedom Partners Action Fund, September 20, 2016. ↑ Freedom Partners Action Fund, 24 Hour Notice FEC Filing, Freedom Partners Action Fund, September 21, 2016. ↑ Freedom Partners Action Fund, 24 Hour Notice FEC Filing, Freedom Partners Action Fund, September 28, 2016. ↑ Freedom Partners Action Fund, 24 Hour Notice FEC Filing, Freedom Partners Action Fund, October 21, 2016. ↑ Freedom Partners Action Fund, 24 Hour Notice FEC Filing, Freedom Partners Action Fund, June 8, 2016. ↑ Freedom Partners Action Fund, 24 Hour Notice FEC Filing, Freedom Partners Action Fund, June 10, 2016. ↑ Freedom Partners, May 27, 2016 IRS Filing, Freedom Partners Action Fund, May 27, 2016. ↑ Freedom Partners, August 1, 2016 IRS Filing, Freedom Partners Action Fund, August 1, 2016. ↑ Freedom Partners, 24 Hour IRS Filing, Freedom Partners Action Fund, August 9, 2016. ↑ Freedom Partners, 24 Hour IRS Filing, Freedom Partners Action Fund, August 16, 2016. ↑ Freedom Partners, 24 Hour IRS Filing, Freedom Partners Action Fund, August 17, 2016. ↑ Freedom Partners, 24 Hour IRS Filing, Freedom Partners Action Fund, August 22, 2016. ↑ Freedom Partners, , Freedom Partners Action Fund, September 21, 2016. ↑ Freedom Partners, , Freedom Partners Action Fund, September 28, 2016. ↑ Federal Election Commission, Independent Expenditures: Freedom Partners Acion Fund, Inc., FEC filing, accessed May 24, 2016. ↑ Federal Election Commission, Itemized Independent Expenditures for Filing 1070799 by FREEDOM PARTNERS ACTION FUND, INC., Propublica FEC itemizer, accessed May 24, 2016. ↑ Federal Election Commission, Itemized Independent Expenditures for Filing 1071501 by FREEDOM PARTNERS ACTION FUND, INC., propublica FEC itemizer, accessed May 24, 2016. ↑ Federal Election Commission, 24 Hour Notice Filing., Freedom Partners Action Fund, August 5, 2016. ↑ Federal Election Commission, 24 Hour Notice Filing., Freedom Partners Action Fund, August 12, 2016. ↑ Federal Election Commission, 24 Hour Notice Filing., Freedom Partners Action Fund, August 17, 2016. ↑ Federal Election Commission, 24 Hour Notice Filing., Freedom Partners Action Fund, August 19, 2016. ↑ Federal Election Commission, Itemized Receipts: Accelerate West Virginia, FEC filing, March 9, 2016. ↑ Freedom Partners Action Fund, Inc., 2015 Year-End Report of Receipts and Disbursements, Federal Elections, January 31, 2016. ↑ 53.0 53.1 53.2 Jesse Marx, Koch and company: time to end corporate welfare, The Desert Sun, January 31, 2016. ↑ 55.0 55.1 55.2 55.3 55.4 Kenneth Vogel, "A Koch love fest in California," Politico, August 3, 2015. ↑ 56.0 56.1 Kenneth P. Vogel, "Charles Koch: We're warriors 'seeking to right injustices'," Politico, August 1, 2015. ↑ 60.0 60.1 Nicholas Confessore, "Koch Brothers’ Budget of $889 Million for 2016 Is on Par With Both Parties’ Spending," New York Times, January 26, 2015. Accessed January 27, 2015. ↑ 62.0 62.1 Alex Roarty, "The Koch Network Spent $100 Million This Election Cycle," National Journal, November 4, 2014. Accessed November 7, 2014. ↑ Matea Gold, "Financial arm of Koch-backed political network launches first direct attack ads," Washington Post, April 8, 2014. ↑ Chris Moody, "The Koch's 'secret bank' takes another step out of the shadows," Yahoo News, April 10, 2014. ↑ Kenneth Vogel, "Koch brothers’ Americans for Prosperity plans $125 million spending spree," Politico, May 9, 2014. ↑ Fredreka Schouten, "Exclusive: Koch-linked PAC raises more than $20 million," USA Today, October 22, 2014. ↑ 68.0 68.1 Freedom Partners, 2014 990, Freedom Partners, 2015. ↑ Lauren Windsor, "Exclusive: Inside the Koch Brothers’ Secret Billionaire Summit," The Nation, June 17, 2014. ↑ 70.0 70.1 Politico"> Kenneth Vogel and Darren Goode, "Kochs launch new super PAC for midterm fight," Politico, June 17, 2014. ↑ Nicholas Confessore, "Koch Group Forms ‘Super PAC’ as 2014 Races Near," New York Times, June 17, 2014. Accessed June 18, 2014. ↑ Igor Bobic, Koch Brothers Plan $300 Million Spending Spree In 2014, Huffington Post, June 16, 2014. ↑ Joanne Faryon and Brad Racino, Secret Summit: 24 hours with the Koch brothers, InewsSource, June 16, 2014. ↑ Laurie Bennett, Who Knew That Cato Had Shareholders?, Forbes, March 2, 2012. ↑ Peter Stone, Koch Brothers Unveil New Strategy at Big Donor Retreat, The Daily Beast, June 13, 2014. ↑ Freedom Partners website, "Energy Policy", organizational webpage accessed June 16, 2014. ↑ Alexis Levinson, "New ads attack Braley, Udall on Obamacare," The Daily Caller, April 7, 2014. ↑ PolitiFact, "Says Bruce Braley took "tens of thousands from his friends in the health insurance industry" and gave them "special favors" by voting for Obamacare," PolitiFact.com, April 8, 2014. ↑ Peter H. Stone, New Koch Brothers Group Revamps Billionaires' Dark Money Operation, The Huffington Post, April 26, 2013. ↑ 82.0 82.1 Brendan Fischer, Ambiguity in Tax Rules and Disintegration of Election Law May Have Led to IRS Tea Party Mess, PRWatch.org, May 15, 2013. ↑ Brendan Fischer, California Elections Board Peels Back Layer of Dark Money Onion, Finds More Onion, PRWatch.org, November 6, 2012. ↑ Peter H. Stone, California Officials Turn Up The Heat On Secretive 'Dark Money' Groups, The Huffington Post, March 24, 2013. ↑ Emma Schwartz, Montana Court Rules “Dark Money” Group Violated State Law PBS Frontline, January 11, 2013. ↑ Eric Lach, Eric Schneiderman Proposes Dark Money Rules, TalkingPointsMemo.com, December 12, 2012. ↑ Paul Blumenthal, IRS Scandal Brings Senate Democrats' Focus To 501(c)(4) Abuse, The Huffington Post, May 21, 2013. ↑ Byron Tau, CREW suing IRS on nonprofit rules, Politico, May 21, 2013. ↑ 89.0 89.1 Freedom Partners, 2015 990, Freedom Partners, 2016. ↑ Freedom Partners, Freedom Partners, About Us, organizational website, accessed October 6, 2014. ↑ Freedom Partners Chamber of Commerce, 2013 IRS Form 990, organizational tax filing, November 21, 2014. ↑ 92.0 92.1 Freedom Partners, Freedom Partners, About Us, organizational website, accessed October 16, 2013. ↑ Nicholas Confessore, "Group Linked to Kochs Admits to Campaign Finance Violations," New York Times, October 24, 2013. ↑ Andy Kroll, "EXCLUSIVE: Read the Koch Brothers' Plans for Their Upcoming GOP Donor Retreat," Mother Jones, April 23, 2014. ↑ Tea Party Patriots About Us, Official Website, accessed October 28, 2013. ↑ Heritage Action for America, About, Heritage Action for America, accessed October 18, 2013. ↑ Robert Maguire and Viveca Novak, "," OpenSecrets, April 26, 2013. ↑ A Snapshot of Ohio-based 501(c) Electioneering Groups Involved with Judicial Elections, Public Citizen, accessed October 30, 2013. ↑ National Association of Manufacturers, About, Official Website, accessed October 30, 2013. ↑ Robert Maguire and Viveca Novak, , "Open Secrets Blog," accessed October 30, 2013. ↑ Center for Shared Services, Mission, Official website, November 1, 2013. ↑ "About NRTWC," National Right to Work Committee website, accessed March 2009. ↑ Lisa Graves, New List of the Dark Money Shell Game Groups Connected to the Kochs, "PRWatch", September 18, 2013. ↑ 105.0 105.1 Open Secrets Blog Koch Group IRS Report Unlocks a Few Mysteries, Open Secrets, accessed November 1, 2013. ↑ Freedom Partners, Freedom Partners, 2017. ↑ Freedom Partners, About Freedom Partners, Freedom Partners, 2017. This page was last edited on 14 February 2019, at 22:47.